Professionalizing Data Science: Let's not blindly repeat history. We're seeing a growing push for the professionalization of Data Science: drawing boundaries around the skills and practices that define the new field, with the goal of deciding exactly who is and isn't a "real" data scientist. Just google "What is a data scientist?" and you'll get dozens of blog posts and articles trying to come to grips with exactly this question. At some level, this is a bit silly -- just a game of semantics and job titles. Who really cares if I call myself a "statistician," "business analyst," or "data scientist?" As long as I can do the work, it shouldn't matter. On the other hand, in other fields, professionalization has been a powerful force for both good and bad. At their best, professional career tracks attract talent, improve training, educate the public, and establish communities of practice that accelerate innovation and improvement. At their worst, professions can become self-serving cartels, excluding many competent practitioners so that the lucky few can hoard influence and wealth. According to George Bernard Shaw, "every profession is a conspiracy against the laity." AFAICT, the professionalization of data science is playing out in all the usual ways: For those of us who identify as data scientists, starting down the path of professionalization feels new, exciting, and uncertain. Maybe we're seeing the formation of a new professional identity -- or maybe the whole thing is going to fly apart. worries about shoddy practitioners, calls for codes of ethics, institutionalized education and credentialing. I can't tell yet if any of this is going to stick. I just know there's a lot of buzz and the possibility that we're at the start of something new and big. Does that orange arrow remind anyone else of a devil's tail? Either way, I'd like to understand where we're headed, to shape the trends in constructive ways. 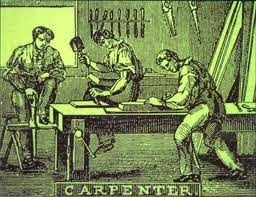 With all that as background, I'm looking for books that tell the history of professions -- how a given circle of people came to be accepted as experts in a given domain. If something of the kind is happening with "Data Science," I don't want to be doomed to repeat history. So far, I've got Schudson's Discovering the News (about journalism), and Lemann's The Big Test (about psychology and academic admissions). Yes, the second one is a bit of a stretch -- this is why I'm asking for help! What other books would you recommend? For example, I'd love to read a good, textured history of the AMA, the bar, or teacher's unions. Theory-oriented stuff from sociology or econ would be interesting, too, as long as it's not too stuffy. Ideas? For each field, how did the boundaries get drawn? For example, why do we regard dentists differently from doctors? Who were the major drivers behind professionalization in each field? What were the factions within each movement? At what point did the field come to share a common identity? 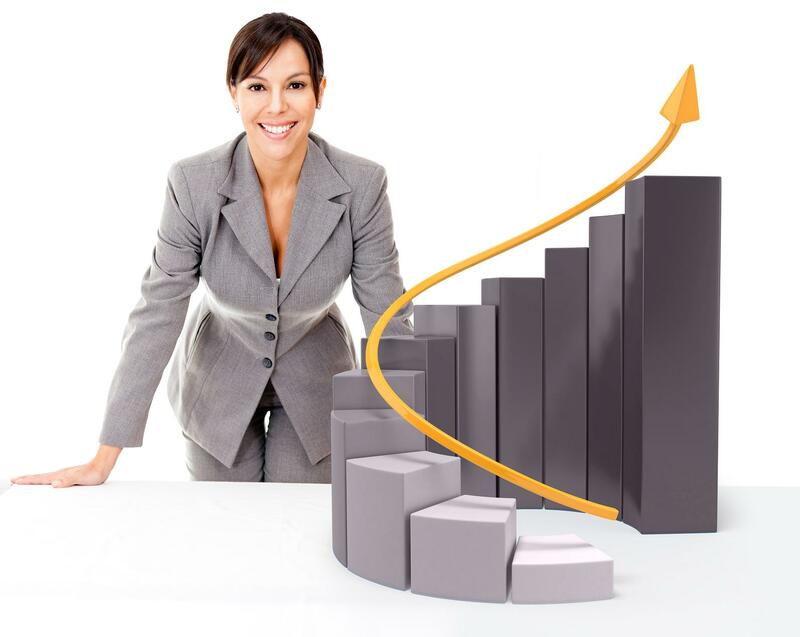 Are there typical stages that professionalization follows? I'm open to other questions as well. These are just for starters. I like the cartoon. 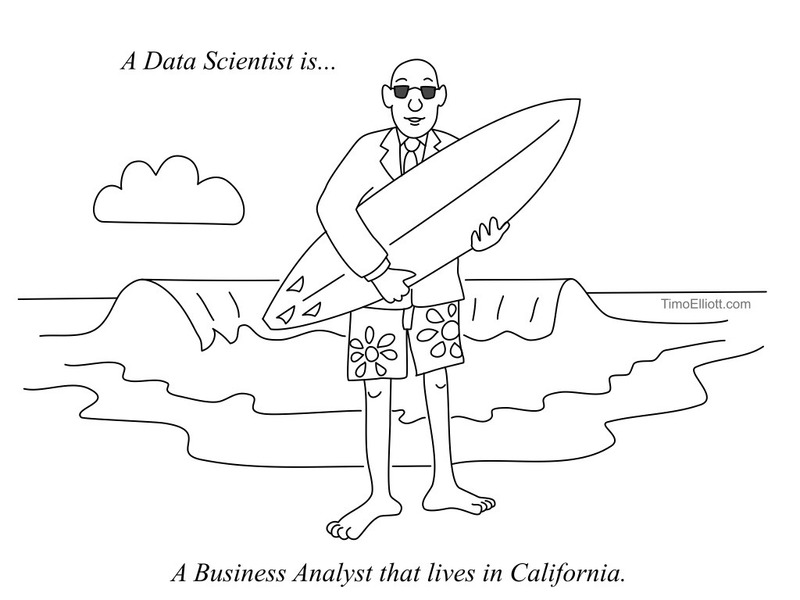 So here in Maryland I work as a business analyst, but I guess if I moved to California I'd become a data scientist. 1 - Since it is a sector that relies on technology, which changes so quickly, the skill set put into place to define what a "real" data scientist is would fairly quickly become outdated. This would be made even worse by the fact that changing the requirements would usually requires to different players (i.e. universities, professional associations...) to reach some type of universal agreement. 2 - Codes of ethics / shoddy practitioners: would professionalization solve anything? I mean you are either honest or you're not. It's not some type of class that will teach you honesty. Maybe Bernard Madoff aced all his business ethics classes, in the end he is still a crook. It's funny you talked about semantics and job titles. I was reading an article about the best-payed software engineers (http://www.wired.com/wiredenterprise/2013/10/salaries/) and in the comment section the discussion quickly turned to the difference between a software engineer, programmer and architect. I think at the end of the day, it's all about what you can do, not what your job title is. I've been itching for someone to ask for a historical/sociological perspective on this live (if inane) debate. It trades in sociological theory but the ideas are pretty on-point (read: professional requirements = boundary maintenance) and it has three case studies, including the "information professions". @Alexis - At an individual level, I completely agree that ability trumps semantics -- just get the job done, and the title doesn't really matter. At a group level, professions have a way of taking on a life of their own. If you want to "practice law," you have to go to law school, pass the bar, and (usually) be hired by a law firm. Those barriers didn't always exist, but they put serious constraints on the practice today. Nothing of the kind exists yet in data science, but I'm seeing stirrings of it. To your point about technology -- I suspect this actually cuts the other direction. The fact that data-centric technologies are under active development means that it's increasingly hard for laymen to participate. I've just finished reading "The Age of Edison," about the mass-marketing of electric lighting, and there's a fascinating set of chapters on how electricians formed a profession -- right in the middle of very active technological innovation around lighting. @Juan-Pablo - You're the third person to recommend Abbott; I guess I'll need to cave and buy it. What other questions do you think need to be asked?